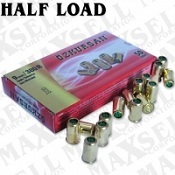 We have your blank gun ammunition, blanks for blank guns, blank firer ammo, blank shooting gun ammunition, blanks, 9MM PA blanks, 380/9MM blanks, half load 380/9mm blanks, 8MM blanks, .22 LR blanks, .22/6MM blanks, crimps or "pine cone" blanks. We do not suggest or guarantee any of our blanks to fit or work in a real gun. The Blanks may be a different brand than the image shown but they will always be the correct, proven reliable highest quality Blanks available. Pack of 50 9MMPA or 9MMPAK banks. They are the same thing. This is blank firing gun ammunition for our 9MMPA or 9MMPAK Automatic Blank Firing guns only. They are NOT for Revolvers. These 9MM PA, 9MMPAK Blanks are about as loud as a real Hand Gun. Package of 50 8MM Extra Loud Blank Ammunition, 8MM Blanks, blank ammo for our 8MM Blank Firing Guns. These 8MM blanks are about as loud as a live handgun. 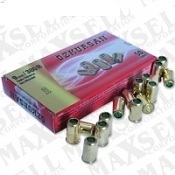 Box of 100 .22 LR Blank Gun Cartridges. These fit our 1873 Peacemaker Blank firing Revolvers in 22 LR Caliber Blank Firing Models ONLY. For blank guns that fire .22 LR Caliber blanks. We do not suggest or guarantee that these or any of our blank gun Blanks will fit any live fire weapon.